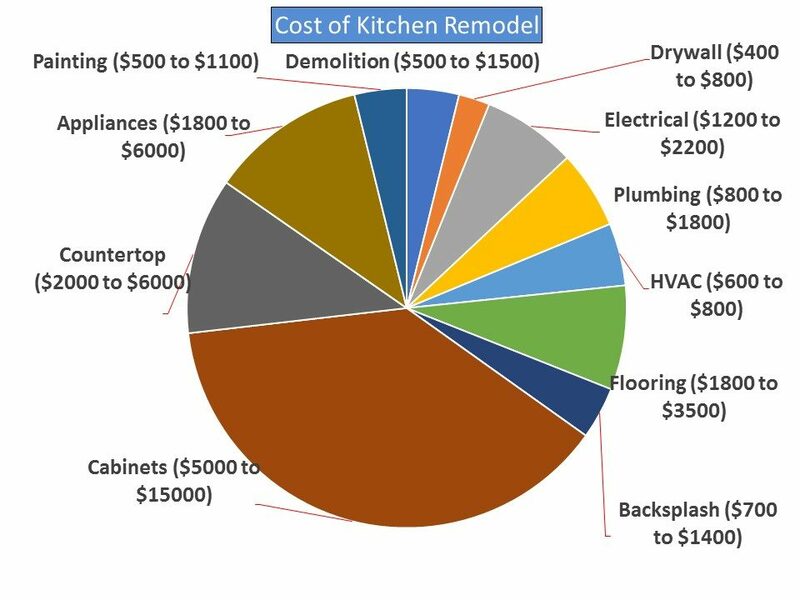 How much a kitchen remodel cost? The cost to renovate a kitchen may range between $ 15,000 to $ 35,000 for a 150 to 400 Sq Ft kitchen on an average. High end kitchens can go beyond $ 35,000!! Below is a straight and simple element wise cost guide to help you budget your kitchen project. Demolition: Removal of old stuff, demolition and disposal can cost in the range of $ 500 to $ 1500 depending upon the size and extent of demolition. Usually the major cost is for demolition of walls, floors and existing cabinets. If you are not changing your wall layout or cutting the existing walls for openings etc., you can save a major chunk! 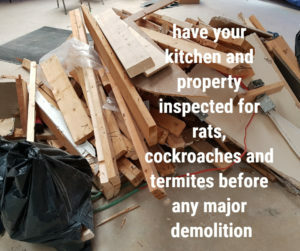 Another wise step to be taken is to have your kitchen and property inspected for rats, cockroaches and termites before any major demolition. Kitchen is a highly prone area for roaches. When you start demolition, these critters will travel from your kitchen to other areas and create big issues later. A proper pre-demolition inspection and pest control is important for your health and safety. Drywall: While we talk about kitchen remodel, it is less likely that you may need an entirely new wall. You may just have to do some modifications or patch works and should count a minimum $ 400 for that. Count additional $ 400 to $ 800 if you have a small new wall or major area drywall replacement. It may not be a good idea to count per sq ft while renovating a kitchen. As the quantities in kitchen will be too small and there will be a minimum charge usually higher that per sq ft bases. You can still consider around $3 – $4 / sq ft installed (all included- ready to paint) but a minimum charge usually $ 400 will exceed that cost particularly in this case. Consider installing moisture resistant board like Green board or tile backer board or cement board in areas behind sink where you are planning a new wall and backsplash. You should not be too much worried as the kitchen is not considered wet area like showers. If you are dealing with existing drywall which is found in a good condition, you may not need a replacement. Electrical: Electrical cost may include wiring, appliance connections and light fixtures. It may also include some necessary upgrades for controls and separation as per electrical safety codes. If you are not looking for very high-end light fixtures than the total electrical cost may range within $ 1200 to $ 2200. Two different requirements need to be considered while electrification of your kitchen. One is basic requirement as per code which is meant for our safety and the Second is based on your plan on appliances and equipment. You need a licensed pro to analyse all this as there are many important factors associated like voltage, amperage, items that need separate dedicated circuit, panel upgrades, what needs GFCI (Ground Fault Circuit Interrupter) and what needs separated from GFCI? 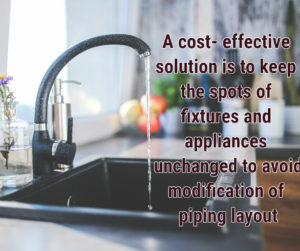 Plumbing: Plumbing cost may include relocating the sink or installing a new sink replacing the existing, changing some old accessories and fittings (valves and traps) etc. If you are going to stick to your existing set up of piping layout without major changes and only few modifications, then the plumbing cost may range between $ 800 to $ 1800. While you change the location of appliances, you are not just simply changing the location, but you are changing all associated piping along with that. A small change or relocation of 1 ft may cost you money and most of the times extension of 1 ft or 5ft length may cost you almost same, as the amount of labour will not be saved much with shorter lengths, you can only save some linear ft of piping materials! The location of appliances and fixtures requiring drains are also critical. Usually, Dishwasher and sinks have a common drain and that too with a set slope in piping layout so that waste water is drained properly. Now it should be clear to you, how changing the location of a fixture or appliance can impact the utilities behind the wall. Looking at above factors, the best cost- effective solution is to keep the spots of fixtures and appliances unchanged and avoid modification of piping layout. HVAC: HVAC means Heating, Ventilating and Air Conditioning. The most important aspect of a good kitchen is ventilation. Having an existing kitchen hood and exhaust duct in proper working condition will make your life much easier while remodeling. Installing a new exhaust duct and range hood may cost around $ 1200- $ 1500 which may involve some roof modifications also. If there is no new ducting involved for exhaust, then some minor modifications (if any) may cost around $ 600 to $ 800. While we talk about remodeling it is obvious that you have something existing and you are upgrading it. If you already have a ducted system attached to range hood, you are lucky, and you don’t have to spend too much on upgrading. If you have ductless system, you should think about changing it to ducted system as it is most effective from ventilation point of view and cost effective in a long run. Ducted system will throw the air out of the kitchen through exhaust while ductless system will circulate the same air after filtering. From air quality point of view, ducted system is the best. To avoid ducting and hood hanging on top, especially at the island kind of design, you can go for downdraft range hood. Downdraft range hood is a hood that is either flush mount at the stove back or pop up style with a button to control it and make it pop up when cooking. The other systems may look cheaper to install or easier for your set up of kitchen but the most efficient is ducted range hood and healthier too! Flooring & Backsplash: Standard range for flooring installation including materials can be $ 12 to $ 25 per sq ft. For small areas like a kitchen it is sometimes not easy to budget on sq ft bases. The flooring may cost around $ 1800 to $ 3500 and backsplash (usually 30 to 40 sq ft in total) may cost around $ 700 to $ 1400 on an average. 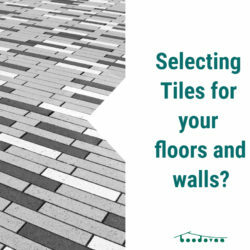 The tile or flooring material you select is decisive factor in the budget calculations. The installation cost for flooring can range between $ 800 to $ 1500 and Backsplash between $ 300 to $ 600. If you know your square foot and the price of the tile, add 5% for extra material to net sq ft and add the installation cost to figure out the budget. The installation cost could be between $ 4 to $ 8 per square foot. 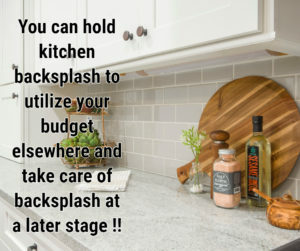 It may not save a lot for you but to hold kitchen backsplash to utilize your budget elsewhere and taking care of backsplash at a later stage after few months can prove to be a good idea. Cabinets: Kitchen cabinets can consume about 35% to 45% of your total budget. There can be lots of design, finishes and materials but the two most important factors to be considered shall be: designed based on your needs and the hardware. The design criteria shall be based on size of cabinets you need, double doors or single doors, number of drawers, size and height of shelves, layout of your appliances, utilizing maximum possible spaces and minimizing filler panels / unusable spots, opening of cabinet doors i.e. right swing or left swing etc. The hardware selection is also an important factor. The criteria for hardware selection shall be based on the finish you need, handle type whether knob type or pull handle type, lockable cabinets, adjustable shelves, hinges, good quality telescopic drawer slides etc. There are lots of choices on finishes but the base material could be either solid wood or MDF (Medium Density Fibreboard). The average cost of solid wood kitchen cabinets can be around $ 480 per linear foot installed and the MDF ones can be $ 220 per linear foot average. If you are not sure about linear ft, consider average cost of $ 5000 to $ 15000 and budget accordingly. If you are looking for refacing, just consider half the price of new cabinets mentioned above. Cost of refinishing cabinets (Sand and Stain/Paint) can range between $ 500 to $ 3000 in total depending upon the size / area of cabinets. Countertops: The average per sq ft cost (installed) of different types of countertops are mentioned below. The cost should not be the only criteria while selecting your countertop. Countertop plays a major role in overall look and feel of your kitchen. You can go for everything white to make it look rich and decent, but a colorful kitchen makes it livelier and more interesting. A contrast combination of cabinets and counter may make it more attractive. 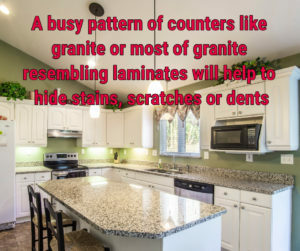 Sometimes, a busy pattern of counters like granite or most of granite resembling laminates will help to hide stains, scratches or dents. Appliances: It is very easy to budget this part of kitchen remodel as you have lots of options and no need to worry about installation costs much. A package including Freezer refrigerator, Dishwasher and Range could start from $1700 to $ 6000 depending upon your needs. As a lot of useful information available online, you can do enough homework before you make a choice on your appliances. 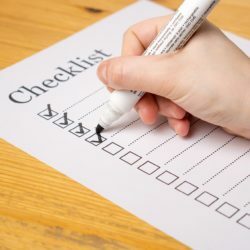 Below are some of the items that must be in your check list. Size of the appliance and compatibility with your layout. Brand that you trust, and lessons learnt from your experience on usage and functionality. Latest technology and features that you may specifically use now or in future. Ease of maintenance, warranty and availability of parts while in need of replacement. The appliances that demand least modification to your existing mechanical and electrical layout. You may not be replacing all your appliances and the finish of new appliance should be a match to your existing one. Budget is most important but sometimes investing a little more in appliances by compromising on some other finish or furniture may prove to be a right decision. 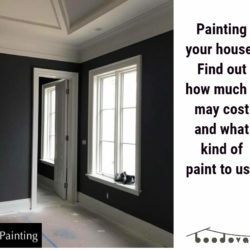 Painting: Considering $ 500 to $ 1100 including Walls and ceiling for budget will work. You can also count your total sq ft and consider $ 2 to $ 3 per sq ft.
Red, Yellow, Green and Orange are the best colors for a kitchen. Every color has a distinct effect on your mood. Painting walls with a light green color will give you peace of mind and painting your kitchen with a red color will give you stimulating and energetic effect. Choosing paint sheen for kitchen is equally important as choosing the color. The shiny paints give durability and can be cleaned easily and that is why they are the best choice for high traffic areas like kitchen. The high sheen paints can resist stains better. Flooring: You can either keep the same floor and spend more on counters etc. or go for vinyl sheet floor which is cheaper. It is not just cheaper, it is also seam less to avoid gathering of dirt and dust in joints which is common in tile joints. Less joints makes it easy to clean too. Cabinets: Try ready made cabinetry instead of custom-made cabinetry. The ready to assemble ones are generally half the cost of custom-made ones. Ready made cabinets may create an issue of unused spaces or corners but you can cover them by filler panels at a very nominal cost.If you keep existing cabinets, you can save lots of money just by refacing / refinishing them.You can also have open shelving in some areas which will save you some more money. Countertop: Plastic Laminate is the most economical one and with a proper installation it resembles same as solid surface/ stone. You can also consider having combination type counters if you have an island or detached ones serving different functions in a single kitchen. Walls: Try to avoid changing of wall layouts. This way you can save money on building new wall as well demolishing existing ones. A cut out may sometimes serve the purpose instead of removing entire wall. Lights: Retrofitting of existing lights may save cost instead of going for new lights and locations. Retrofitting is using same old fixture but upgrading its internal components so that it gives better and brighter light while saving energy at the same time. It proves a cost-effective solution at a longer run. Appliances: Keep the appliances at the same location. If you change the location, you will have to pay for relocation of electricals, plumbing, exhaust etc. to facilitate new location of your appliances. Now if you are ready to go for your kitchen remodel, search your near by PRO to help you on your project. Visit boodovaa.com to review listings of contractor’s who can offer best services on kitchen remodel. Please Note: This cost guide is created to help you on budgeting so that you can decide where you will be able to save or utilize your money more effectively. Also, the purpose is to make you more informed while you finalize a contractor for your project. We recommend that it is a wise decision to use a professional renovation contractor who can take care of all trades for you. 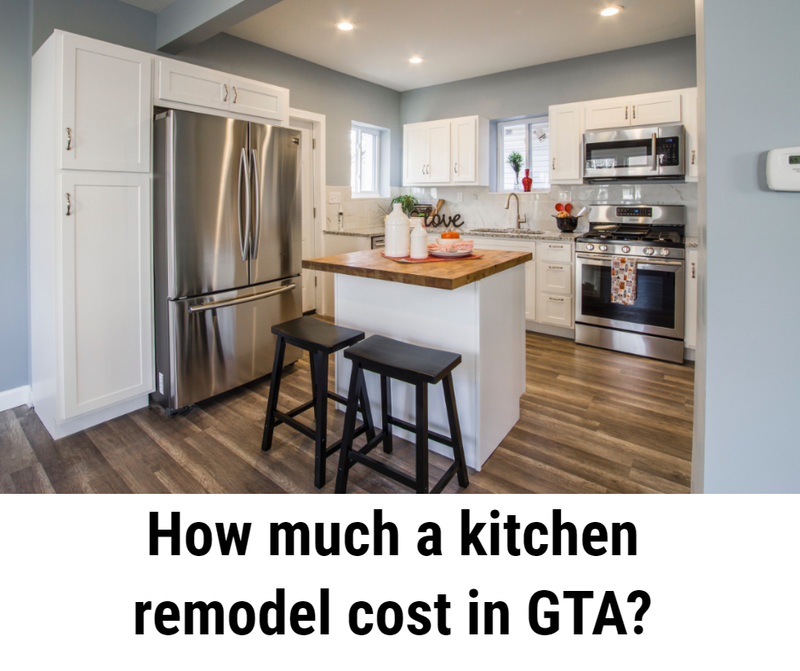 Costs are in CAD based on GTA construction market.